If you are looking for information on the KFC franchise business opportunity, Kentucky Fried Chicken franchises or KFC restaurant franchising, then you have come to the right place. There's Fast Food...Then There's KFC! In 1939, Colonel Harland Sanders first gave the world a taste of his most famous creation, Original Recipe® Kentucky Fried Chicken, featuring that secret blend of 11 herbs. In 1952, he signed up his first franchisee and thus began the legend that is KFC, the largest chicken fast-food empire in the world. Millions of people have come to love his one of a kind chicken, home-style side dishes and hot and fresh biscuits. Today, more than a billion of the Colonel's "finger lickin' good" chicken dinners are served annually. And not just in North America. 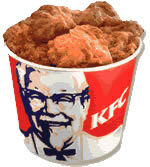 The Colonel's cooking is available in more than 80 countries and territories around the world. And with Yum! Brands, you can bring one to YOUR city. KFC is just one brand owned by Yum! Brands, Inc. Yum! Brands also owns A&W All-American Food Restaurants, Long John Silvers, Pizza Hut and Taco Bell restaurants, and is the world's largest restaurant company in terms of system units with nearly 32,500 in more than 100 countries and territories. This is your opportunity to invest in KFC and Yum! Brands and experience the power of big, category-leading brands! We believe there has never been a more exciting time to be a part of Yum! Brands and KFC! When we created Yum! Brands, we had the privilege of possessing a heritage of success established by the founders of KFC, Pizza Hut, Taco Bell, Long John Silvers, and A&W. Their leadership and innovation helped launch the quick service restaurant industry. The brands they created enjoy worldwide recognition and popularity. Yum! Brands is the biggest restaurant company in the world, and we are the worldwide leader in our product categories! Proven Support from Yum! & KFC - You become part of an organization with tremendous franchise support including advertising, business coaching, training, development and cooperative sourcing. We strive to work as "one system" because it's the best way to meet our customer's needs. You invest in us. We invest in you. Advertising & Marketing - Yum! is committed to making KFC even bigger. Last year alone, Yum! and its franchisees spent more than $600 million in consumer advertising. National marketing news is communicated regularly throughout the year. Many markets have local advertising cooperatives to coordinate local marketing activity. Franchisees are encouraged, but not required, to participate in system promotions. Coaching - KFC has Franchise Business Coaches (FBCs) and/or Franchise Business Leaders (FBLs) to provide business insight and instruction as you operate your KFC. As you move into steady-state operations, your FBC or FBL will keep you abreast of important business initiatives, organize key regional training activity, and be your primary point of contact. Training - Yum! requires that each franchisee complete Management Team Training prior to the opening of their KFC. Single brands require six to eight weeks training for key restaurant personnel. Multibrand training depends on your level of previous quick-service restaurant (QSR) experience. Standardized Building Plans/Yum! Development Services - Yum provides franchisees with standardized building plans for all endorsed brand combinations, including typical site layouts, exterior and interior facility design, architectural specifications, standard equipment schedules, equipment cut sheets, and cost baselines. Unified Foodservice Purchasing Co-op, LLC (UFPC) - UFPC provides supply chain management services exclusively for all corporate and most franchise-owned A&W(r) All-American Food, KFC(r), Long John Silver's(r), Pizza Hut(r) and Taco Bell(r) outlets in the United States. Since March 1999 UFPC has saved Yum! more than $539.6 million by negotiating costs, making volume purchase commitments and assuming other procurement functions and risks that reduce suppliers' costs. ... a Yum! Brands franchise is a once-in-a-lifetime opportunity!